Have you ever been flooded out? Do you pay high water bills and don’t know why? Do you pay for water leaks you don’t know about? Are your water supplies in the ground and wall under your control? Do you know what a leaky toilet or faucet could result in? Has the hose from your toilet, faucet, washing machine, etc. ever burst? Has your bathtub overflowed, have you or your children failed to close a faucet properly? Would you like to have peace of mind, with your consumption and water flow under control online? eVodník® is a Czech electronic device designed to automatically eliminate the aforementioned problems and many other possible ones in the water pipes and devices connected to them in flats, houses, commercial premises, office buildings, archives, studios, data centres, educational, social and medical facilities, sub-areas, and wherever you would not want water to damage/destroy your property and cause a hole in your wallet due to unwanted water “consumption”. Automatic shut off the water supply if there is unwanted water leak or an accident in the water piping. Detailed overview of the water consumption and its cost in real time. All of this online in your PC, laptop or mobile phone. User management system via the Internet, including controlling, configuring and monitoring of devices by authorized persons. The system alerts users to variations in water consumption compared to common consumption by sending warning e-mails and SMS. 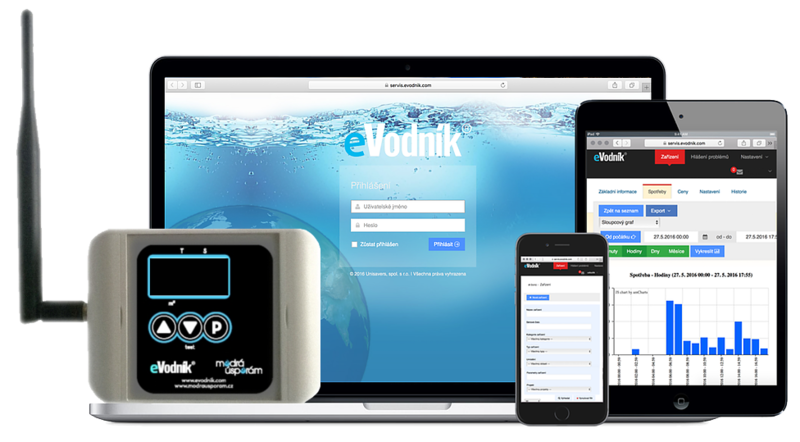 Thanks to the connection with our original software, eVodník® can identify and report in detail your water consumption. eVodník® is able to control the water consumption and, in the event of water piping disturbances, the water supply is automatically closed. eVodník® thus prevents any accidents, unwanted water leaks and resulting financial damage. eVodník® is the original Czech product! For more information use our non-binding request form in the contacts section.